The get more out of our music on our iPads, especially when in the office with our headphones on, many folks have chosen to use the MyTunes app. The software offers many fine tuning adjustments for your music playback through different speakers/headphones and iWOW SRS enhancements. The music playback is noticeably fuller. For more info, you can read the review we did of the app on this site last year. The developers of MyTunes released a update yesterday that included many mentions of the better management of iTunes Match music and a few overall button enhancements as well. What caught our attention was the mention of “un-enhanced DRM playback”. What DRM? When we launched MyTunes, we found our music list included all of the songs up in the Apple Cloud as well as what is loaded on our iPads. You can tell your iTunes Match music as the songs with the ‘!’ inside of a triangle icon on each line. The song is one that was ripped to our iTunes desktop from a CD we owned. It matched with one that Apple already had in their cloud so it didn’t need to get uploaded. But, it would appear that when this happens, the song gets a layer of Apple DRM applied which rules include no ‘enhancing’. This means that while MyTunes will download/play the song, it won’t be applying any of the iWOW SRS magic to it’s playback. 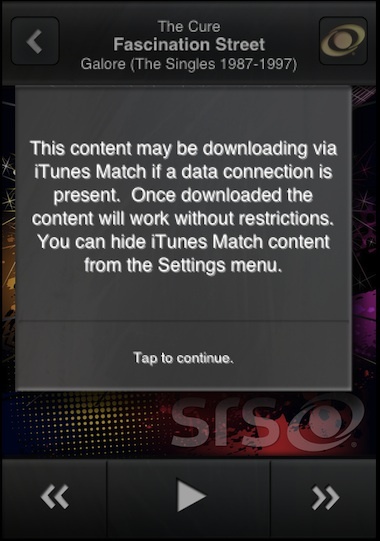 The below popped up when selecting a song to play that was also in the iTunes Match cloud. 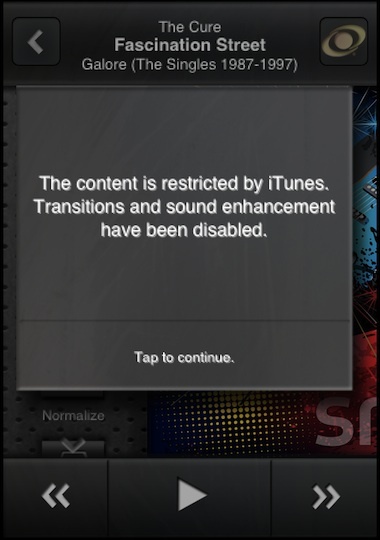 We aren’t sure what is meant by the playback “without restrictions”. The song does play after it downloads but the audio enhancements won’t be applied. When playing a song that is from the iTunes Match cloud, the iWOW logo flashes in the upper right corner of the MyTunes screen. 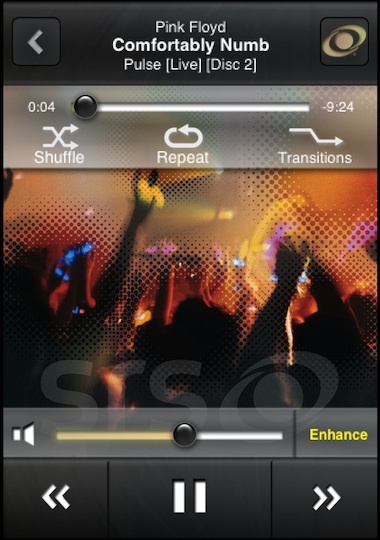 Tapping the icon brings up the box like above stating that the song can not have the SRS sound enhancements applied for playback. Basically, this means that if you want to play all your music enhanced and not worry about it, only choose the songs you have installed on your iPad. 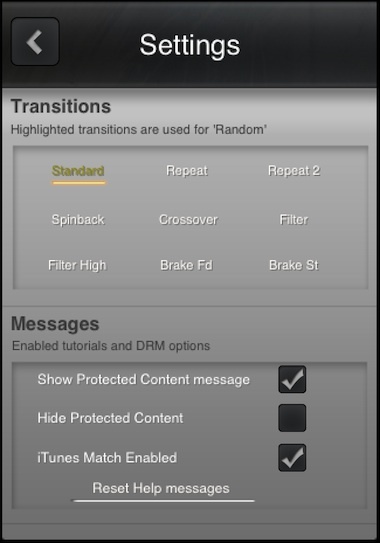 To avoid confusion, the settings area of MyTunes lets you adjust what is shown in the music list, allowing for no Apple DRM songs to appear in your list to play.